This Mango Pappu /mango dal with steamed rice, potato fry, pickles is the best combo. 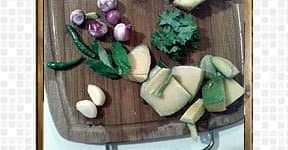 This recipe is little tangier and no need to add tomatoes or tamarind, as mango has to gots its sourness. I went with frozen mangoes, as Indian raw mangoes are not available here. But frozen mangoes to provides the same taste and flavor and I’m quite happy with it. Mango’s unique interesting flavor beautifully enhances this recipe. 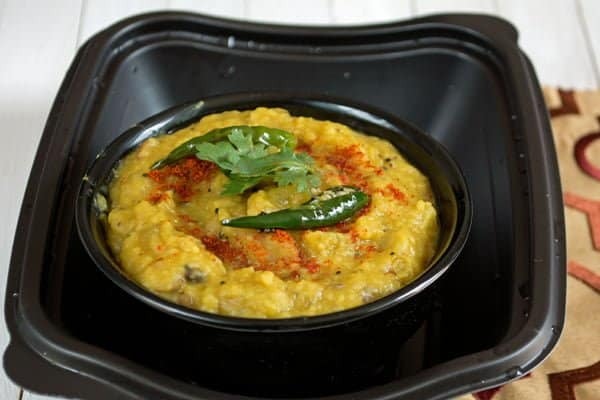 Lentils / Dal / Pappu / Paruppu is rich protein content and rich in folic acid. We loved its mashed up the texture and everybody would love who don’t want to feel the chunks while eating. This Mango Pappu Recipe is best with steamed rice, and the left over can also be served as a side for Chapathies along with pickle. Do Check out this Pineapple rasam recipe also, which make another combo with the rice. Looking for other Andhra Recipe, do check tomato Pappu(Lentils with Tomato), another great recipe to be served with rice. This Mango Pappu is my family’s all-time favorite recipe. It’s a huge hit in our family not only because of its taste and color but also because of a friendship tied back with this recipe. It was introduced to us by one of our beloved family friends from Andhra, We all always overwhelmed with their hospitality, their kind heartedness. It may sound funny but really this Mamidikkaya Pappu reflects me their happy faces. Food served with lots of affection will double up their taste too right? 1. Prep all the ingredients, and chop them all well. Slit green chilies if you do not prefer its hotness, otherwise, you can chop them. 2. 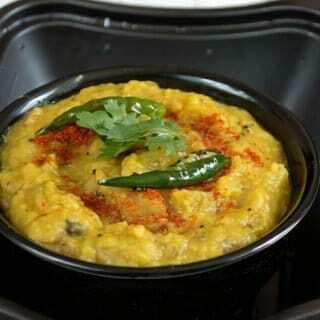 Pressure cook Toor dal with 1 Cup of water to the mashed up consistency. 3. For seasoning, heat oil in the pan add mustard seeds, urad dal, asafoetida and wait for the mustard to get splutter. Then add chopped onion and fry it till it becomes pink. Add green chilies, chopped garlic and chopped mango and saute them for 1 min in high flame. 4. Add this season to the cooked and mashed dal. Close the pressure cooker lid and cook it again for a whistle or till everything blends together. 5. Once the pressure cooker steam released, remove the lid and serve Andhra Mango Dal hot with the hot steamed rice along with pickles. Mango Pappu /mango dal with steamed rice, potato fry, pickles is the best combo. This recipe is little tangier and no need to add tomatoes or tamarind, as mango has to gots its sourness. Prep all the ingredients, and chop them all well. Slit green chilies if you do not prefer its hotness, otherwise, you can chop them. 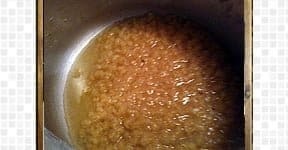 Pressure cook Toor dal with 1 Cup of water to the mashed up consistency. For seasoning, heat oil in the pan add mustard seeds, urad dal, asafoetida and wait for the mustard to get splutter. Then add chopped onion and fry it till it becomes pink. 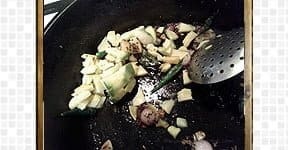 Add green chilies, chopped garlic and chopped mango and saute them for 1 min in high flame. 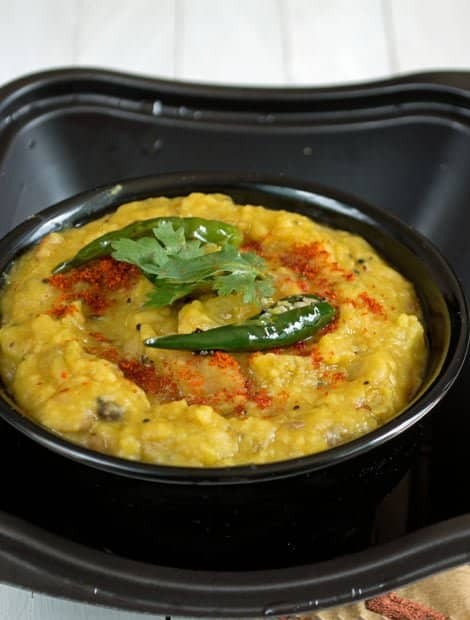 Add this season to the cooked and mashed dal. Close the pressure cooker lid and cook it again for a whistle or till everything blends together. 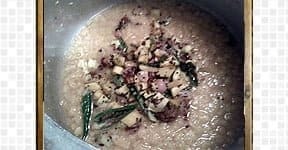 Once the pressure cooker steam released, remove the lid and serve Andhra Mango Dal hot with the hot steamed rice along with pickles. Mangoes can be substituted with frozen mangoes. Make this thicker or thinner by adjusting the water quantity. Have to try very soon. Looks awesome.